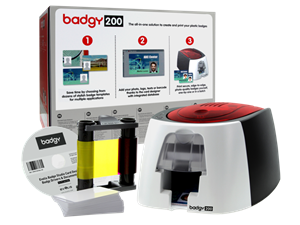 The Badgy 200 provides you with a complete, turnkey solution for PC or Mac, consisting of a plastic card printer, the Evolis Badge Studio® card personalisation software and a pack of consumables (colour ribbon and blank plastic cards) for 100 prints. In addition, a free card template library is available at www.badgy.com, where you can personalise the template of your choice, adding text, logos, photos, barcodes and more. Badgy 200 allows you to print your own cards instantly and completely independently. Print your badges as you need them as single cards or in small batches. Badgy 200 has an output of 95 colour cards per hour. You can also import data from a database, adding information to your card designs in a single click, and launching a print run of your badges with one command, including variable data. The Badgy 200 printer generates personalised plastic cards, with professional-quality, edge-to-edge printing, highlighting your organisations brand image. The Badgy 200 printer is smaller than an A4 sheet of paper, which means it can fit easily into any workspace. Thanks to its light weight (just 1.7 kg) and its carrying bag (sold separately), the Badgy can easily be transported.